College of Education’s Lisa Stueve, Ed.D. (left) and Kania Greer, Ed.D. 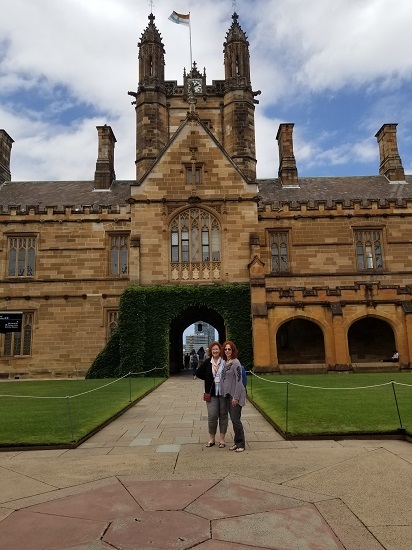 are pictured at the University of Sydney in Australia. Georgia Southern College of Education’s (COE) Institute for Interdisciplinary STEM Education (i2STEMe) Coordinator Kania Greer, Ed.D., and Outreach Coordinator Lisa Stueve, Ed.D., recently presented “International Professional Development: Lessons Learned” at the inaugural International Conference on Education and Learning (ICEL), held in Sydney, Australia. Greer and Stueve based their presentation on the Institute’s experience working with the STEM Academy of USA in 2017 to create a three-day professional development offered to 40 teachers from six local schools in West Bengal, India and their continued collaboration with the organization to work with Indian STEM educators. The conference included educational professionals representing countries including Sweden, South Korea, China, India, South Africa, Australia, Thailand and the United States. Greer and Stueve made connections with many of the attendees and are in conversations with Swedish colleagues about future collaborations. During last year’s training in India, i2STEMe visited the local zoo for a project-based learning opportunity. Students evaluated existing animal habitats at the Arignar Anna Zoological Park in Chennai, Stueve explained, and were asked to work within the parameters of the land available to design improved habitats for some of the residents. The mission ofi2STEMe is to provide professional development, engage in community outreach and seek external funding to promote STEM teaching and learning in both formal and informal educational settings. The Institute hosts many annual events including summer camps, Science Olympiad and the annual Interdisciplinary STEM Teaching and Learning Conference. The Institute was founded in 2012 and collaborates with all colleges at the University to enhance STEM experience and education.